Its fair time in Carcassonne. A traveling salesman arrives and brings his newest invention: a wonderous catapult! This expansion adds a fun, quirky element to what can be very serious games. The Catapult introduces a dexterity component to the game where players fling tokens across the board that can change gameplay drastically. This is a great expansion to use when playing with light gamers or with a younger crowd. 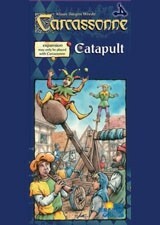 The Catapult adds a dexterity to the Carcassonne base game. Go to the fair and hone your targeting skills with the catapult. Includes 12 new tiles.